The ending to Gary Neville’s Manchester United career is not how he would have wished it to be, thanks to repeated injuries which have kept him off the pitch. He missed out on pretty much the entire 2007-2008 season, which saw us win the league title and European Cup, and hasn’t managed to get a run in the team since. Neville reckons he still does have something to contribute and the manager must think the same, but his situation is very frustrating. lets hope he can stay injury free - not the player he was, but his experience is invaluable. He's invaluable...in the dressing room. I hope SAF only uses him against the weaker teams and the Carling Cup. I would hate to see him run ragged by a younger, lesser winger at this stage in his career. I don't know. I don't want to slate a United great (he is!) but I believe that at the moment I'd choose Brown over him every time and when Rafa (not the FSW lol) develops more as a defender he'd become my first choice. 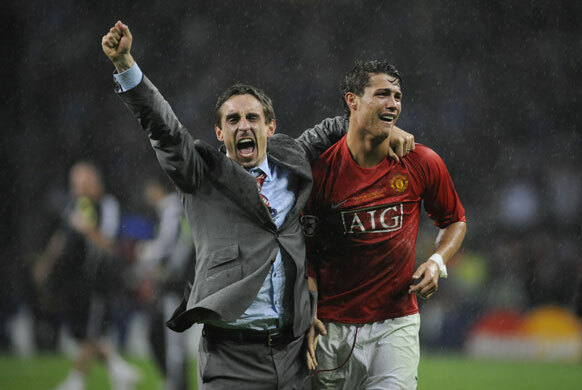 Gary Neville is a Red.. I have the utmost respect for Gary, he's a true red through and through. His experience and presence in the dressing room will help our younger players. I feel we can still use Gary in the games against weaker sides. But I wouldn't want to see him against young and pacey wingers like Aron Lennon, Ashley Young etc. Superb player and servant to the club but his day has gone I am afraid, love him to bits but unfortunalty time hasn't been kind and the game is getting faster. As a squad member, perhaps (unfortunately, injuries aren't even allowing him to do that!). Instead, now is the time for Rafael to be groomed as his long-term successor with Wes used as cover. At this stage RedNev should just (and is) focus(ing) on being the excellent influence on the younger players coming through that he is. Great player in his day, but I think Fergie wants him more now for experience in the dressing room more than on the pitch. Someone the kids can look upto. I don't think Red Nev is good enough on the pitch anymore. I think he is invaluable in the dressing room though as are Scholesand Giggsy. I think nev will take ova from ole looking after the reserves, ole's destined to be saf number 2.
he may not be at his best now, but he's one mega inspiration when he's on the pitch.And he's a i'll-keep-the-young-ones-grounded-to-reality type.Really wish he'll be injury-free from now on. "If you're good enough, you're not too old." Alas, from what I've seen of RedNev, he's no longer good enough. And I wonder just how much his "experience" counts for with younger players - this is a canard that's frequently repeated in professional sports but my guess would be that almost all young professional athletes (in any sport) have so much self-belief that they don't look for "role models" but trust in their own abilities. When they succeed then they're confident, when they screw up then they're big-headed but in either case they tend to look in the mirror first. Someone like Ole (in the accompanying article) would be the exception to the rule. And, most athletes looking back on their careers tend to forget (or minify) their enormous ego and learn to talk-the-talk so I'd count their valuation of changing-room-experience with a grain of sand. Really, how much do you think Raphael (or Fabio) "look up" to a geezer like RedNev who is in direct competition for a place - and a pay-packet ?